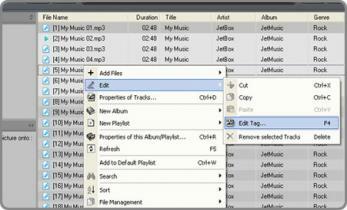 JetAudio is a free multimedia player with extra capabilities such as audio CD burning, music recording, conversion to other file mode and many others. Additionally you can use JetAudio to create your personal broadcasting system by connecting the program to JetCast (provided with JetAudio). JetAudio has optimized ID3 tag, skins, playback for MPC, MOV and m3u formats and JetCast contains new options for Queue-up and port-forwarding. - Support is provided for all the popular media formats. - Additional functions such as: audio CD burning, audio recording, sound effects, visualizations, speed control, resume, synchronized lyric, equalizer, alarm and timer, tag editing, subtitles, multichannel sound output, crossfading and others. - Internet broadcasting along with JetCast. - Playlist and album management. - Customizable appearance through skins.